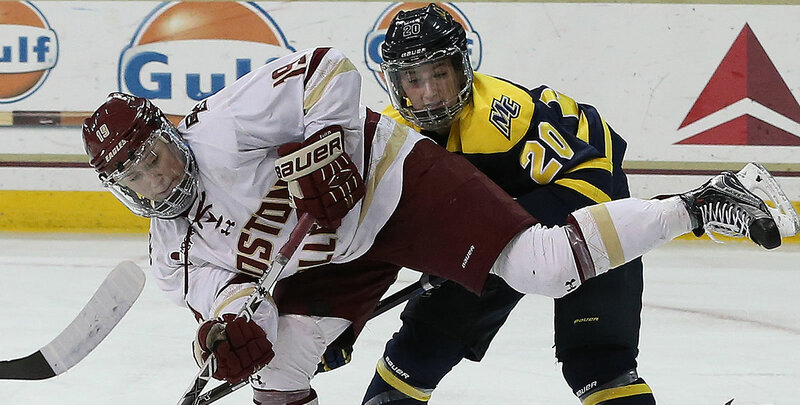 Boston College and Merrimack wrap up their regular season series this weekend in a home and home. - This weekend marks the second time this season that the #8 Friars and Crusaders will meet. The Friars took game one, 5-0, back on October 12. - Maureen Murphy (Buffalo, N.Y.) had four points (3g, 1a) over the three games. The sophomore forward earned Hockey East Player of the Month honors, as well as National Player of the Month Honors, for her efforts in November. In that span, the Friars went 8-0-0 and the forward recorded 14 points on eight goals and six assists, including five game-winning goals. - Holy Cross is coming off a historic weekend that saw them knock off then-#5 Northeastern for the Crusaders' first win of the season and their first win in Hockey East play since joining the conference as a Division I program. - Julie Matthias (Thornton, Colo.) had four points in Friday night's victory, dishing out four helpers en route to earning Hockey East Co-Player of the Week honors, while Rachel Moore (Falmouth, Mass.) netted her first two goals for Holy Cross. - The #9 Eagles and Warriors wrap up their regular season series this weekend in a home and home. The two teams met for the first time this year back on October 19, with Boston College skating away with a 3-1 victory. - Katie Crowley's squad will look to bounce back this weekend after a three-game slide last week. Their two most recent losses come at the hands of cross-town rival Boston University, marking the first time the Terriers have swept the Eagles in a weekend series. - Defenseman Megan Keller (Farmington Hills, Mich.) led all Boston College players last week with three points (1g, 2a). The senior has recorded a point in 14 out of 17 games played this season. - Merrimack dropped two Hockey East match-ups in a home and home series with New Hampshire last weekend. The Warriors' comeback efforts came up short on Friday, falling 3-2, before forcing an overtime frame on Saturday, only to drop that game, 4-3. - Katelyn Rae (Courtice, Ont.) pushed her point streak to three games after finding the back of the net once in each setback. The senior has a point in 13 of 16 games this season, posting 17 points (12g, 5a) in that span. - Boston University heads into the last weekend of play before the winter break after taking four points from crosstown rival Boston College in a home and home series. The games were the final two regular season meetings for the programs, and the Terriers walked away the winners of the Battle of Comm. Ave after posting a 2-1-0 record against the Eagles. - Sammy Davis (Pembroke, Mass.) paced the Terriers up front with five assists on the weekend. The junior is now riding a seven-game point streak with 15 points (4g, 11a) in that span. She earned Hockey East Co-Player of the Week honors for her role in helping BU to a three-win performance last week. - On the back end for the Terriers, Kate Stewart (Chilliwack, B.C.) earned her second win of the season on Friday in just her second appearance of the year. The freshman turned away 42 Eagle attempts to preserve a 3-2 victory and earned Pro Ambitions Rookie of the Week accolades for her play. - Vermont heads to Yale for two games after going 1-1-0 on the weekend in a two-game home stand against Hockey East opponent Maine. The Catamounts lost, 2-1, on Friday, before bouncing back to a 3-2 victory on Saturday. - Freshman Maude Poulin-Labelle (Sherbrooke, Que.) notched the game-winning tally in Saturday's win, the rookie's first game-winning goal of her career. - Maine travels south to Harvard for a one game stint on Friday night, wrapping up the first half of the Black Bears' season. The Black Bears have fared well in non-conference action to date, posting a 6-0-0 record outside of Hockey East play. - Carly Jackson (Amherst, N.S.) most recently recorded 45 saves in 1-1-0 weekend at Vermont, including 23 in Friday's victory to help seal the win. - New Hampshire extended its win streak to four games after taking down Merrimack and Dartmouth in three games in five days last week. The Wildcats earned four points in league play from the Warriors, winning, 3-2, on Friday and earning a 4-3 overtime victory on Saturday. They then shutout Dartmouth, 2-0, on the road Tuesday night. - Taylor Wenczkowski (Rochester, N.H.) pushed her point streak to four games after netting three goals and adding two assists on the weekend. The junior's goals included the overtime game-winner on Saturday just 28 seconds into the extra frame.